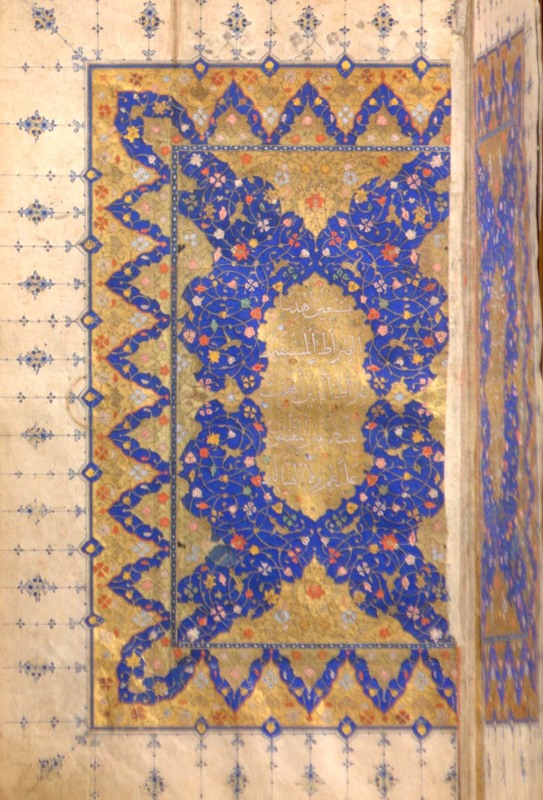 Persian Koran, possibly sixteenth century (not yet available in the JRL Image Collection). Low-resolution cropped RGB images derived from the hyperspectral images are shown below.The hyperspectral images were acquired with a hyperspectral imaging system similar to that described in the article Foster et al. (2006). An array of seven Munsell papers (not shown in the cropped RGB images) placed next to each manuscript was included in the hyperspectral image to enable spectral reflectance calibration and validation. An introduction to deriving RGB colour images from hyperspectral images is available here and an informal account of one of the acquisitions is available here. The three hyperspectral reflectance images can each be downloaded as a zipped file by clicking on the link at the bottom of each RGB image. Each zipped file contains the following: a Matlab MAT image-reflectance file (Mathworks, Inc., Natick, MA) of size e.g. 1344 × 1024 × 33 (rows × columns × wavelengths); an ASCII TXT calibration-reflectance file for the seven Munsell papers; an RGB BMP image derived from the hyperspectral image; a PDF information file containing details of the hyperspectral system, image acquisition, and processing; and a PDF copy of the article Foster et al. (2006). The version of Matlab used to save these files was 7.14.0.739 (R2012a). Other hyperspectral images are available here, here, here, and here. If you publish any work using these images, please cite in full the most relevant article for the methods: Foster, D.H., Amano, K., Nascimento, S.M.C., & Foster, M.J. (2006). Frequency of metamerism in natural scenes. Journal of the Optical Society of America A, 23, 2359-2372. The hyperspectral system consisted of a low-noise Peltier-cooled digital camera providing a spatial resolution of 1344 × 1024 pixels (Hamamatsu C4742-80-12AG, Hamamatsu Photonics K. K., Japan) with a fast tunable liquid-crystal filter (VariSpec VIS-10-35-STD, PerkinElmer, Inc., Waltham, MA) mounted in front of the lens (Pentax C7528-M, 75 mm, Pentax Ricoh Imaging Co Ltd, Tokyo, Japan), together with an infrared blocking filter. Aperture was set to f/5.6. The acceptance angle of the system was approx. 6 deg. The intensity response at each pixel, recorded with 12-bit precision, was linear over the entire dynamic range. The peak-transmission wavelength was varied in 10-nm steps over 400–720 nm and the bandwidth (FWHM) was 10 nm at 550 nm, decreasing to 7 nm at 400 nm and increasing to 16 nm at 720 nm. Before image acquisition, the exposure at each wavelength was determined by an automatic routine so that maximum pixel output was within 86–90% of saturation. R'(x,y,w) = [S(x,y,w) – D(x,y,w)] / [F(x,y,w) – D(x,y,w)]. The grey-scale images at each wavelength were registered with an in-house registration routine, and a small spectral correction was made for long-wavelength leakage. At each wavelength, the effective reflectance was obtained by regressing the uncalibrated normalized reflectance against the reflectances of four Munsell neutral papers (Munsell Book of Color-Matte Finish Collection, Munsell Color Corporation, Baltimore, MD) from the array placed next to the manuscript. The goodness of the reflectance calibration was tested against three Munsell coloured papers from the same array, the results of which are given in the downloadable files. All reference spectra were calibrated with a scanning spectrophotometer (Shimadzu UV-3101PC, UV-VIS-NIR, Shimadzu Corp., Kyoto, Japan). Because the calculated spectral reflectances were obtained by regression against known spectral reflectances (Section 3), some estimated pixel spectral reflectance values may fall below zero or exceed unity owing to random fluctuations in the recorded signal. 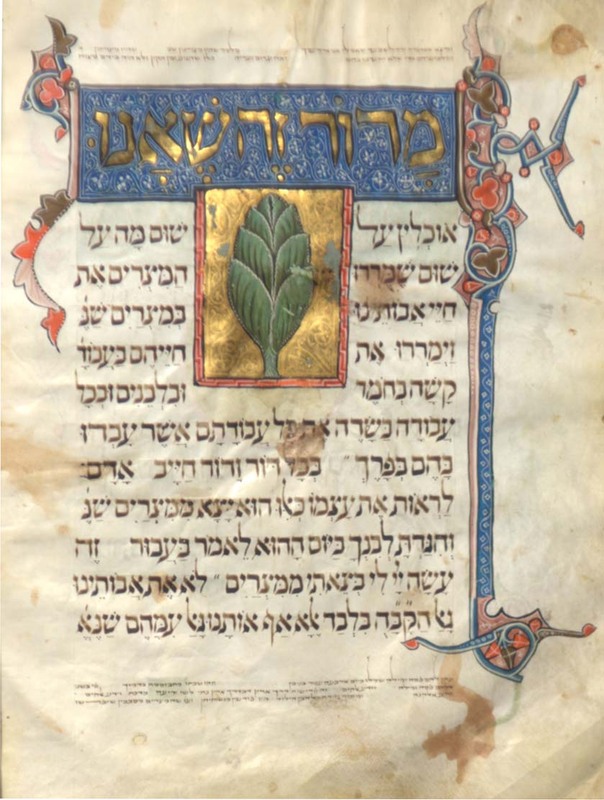 More importantly, because some of the manuscript surfaces, most notably the Haggadah, contained elements that were specular in the chosen viewing geometry, their calculated spectral reflectances exceed unity by a large factor. For calculations with extreme spectral reflectances (see e.g. here), values below zero may be set to zero. Values above unity may be set to unity or the whole image rescaled uniformly so that the maximum is unity. The choice depends on whether you want to (a) capture the colours of non-specular surfaces or (b) show the full range including specularities. There are small residual registration artefacts at the edges of the images generated in the registration process. The outermost 5 pixels from around the edges of the frame should therefore be removed. These data are for personal use only. A full citation of the most relevant article for the methods used here should be given in any published work arising from these data: Foster, D.H., Amano, K., Nascimento, S.M.C., & Foster, M.J. (2006). Frequency of metamerism in natural scenes. Journal of the Optical Society of America A, 23, 2359-2372. 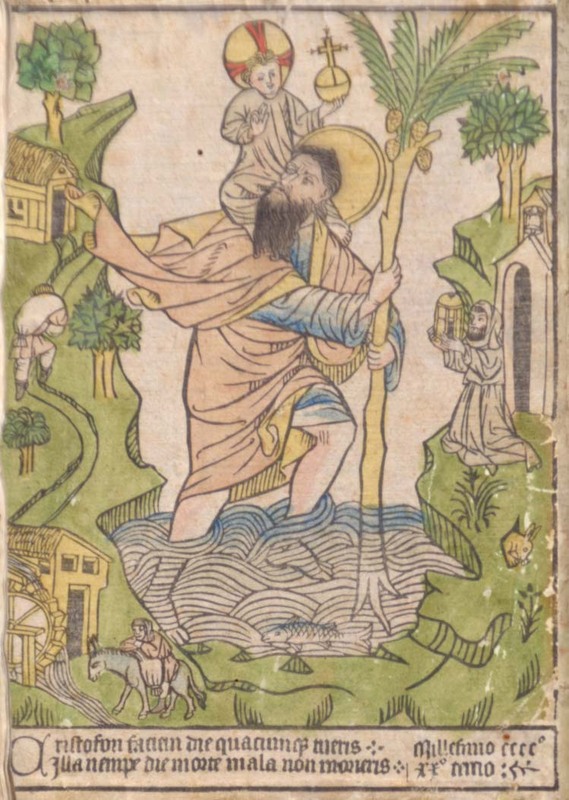 We thank Caroline Checkley-Scott and Carol Burrows, John Rylands Library, for making these works available; James Robinson, John Rylands Library, for technical support; Halleh Mortazavi, University of Manchester, and Lucy-Anne Hunt, Manchester Metropolitan University, for help in the image acquisition of the Persian Koran; and Sérgio M. C. Nascimento, University of Minho, Portugal, for help with the calibration of the tuneable filter and Munsell papers. Matlab is a registered product of the Mathworks, Inc. (Natick, MA).